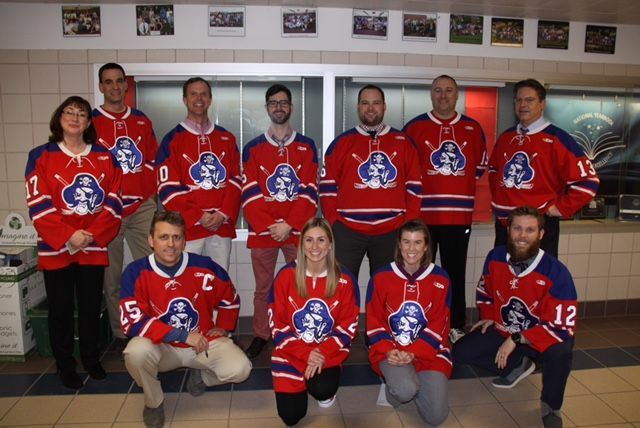 Thanks to all the Fairport Hockey Alumni for joining us today for the 2018 Alumni Game - 50th Anniversary edition. We had a fantastic turn-out from both players and families. Special thanks to Tom Giglia and John Ball for organizing and score keeping. Once A Raider, Always a Raider! A few additional pictures here. 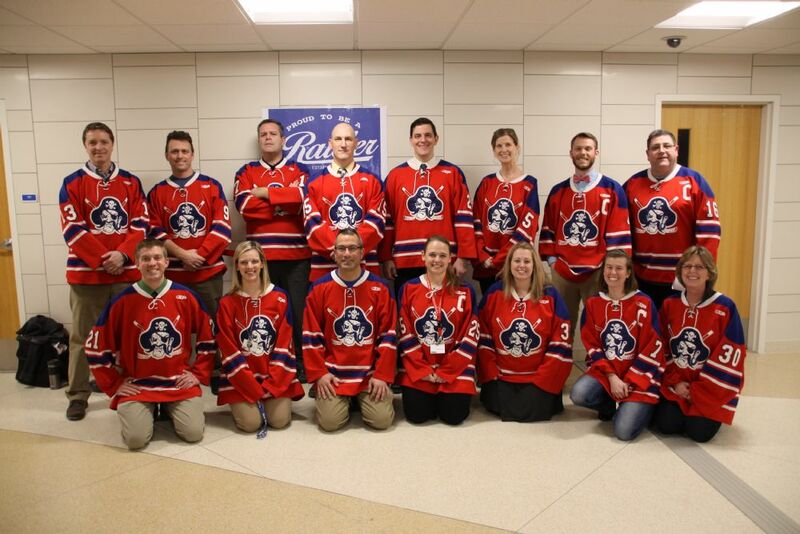 The Varsity hockey team thanks the staff and teachers of the Fairport school system for their support! 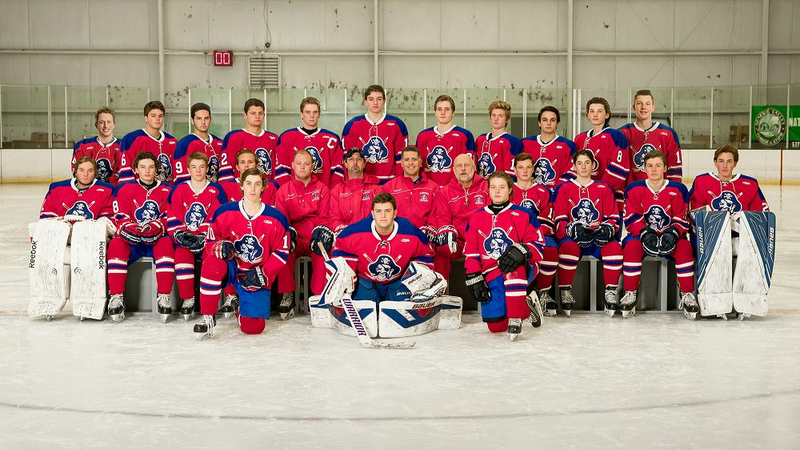 The Varsity hockey team thanks their teachers for their support. 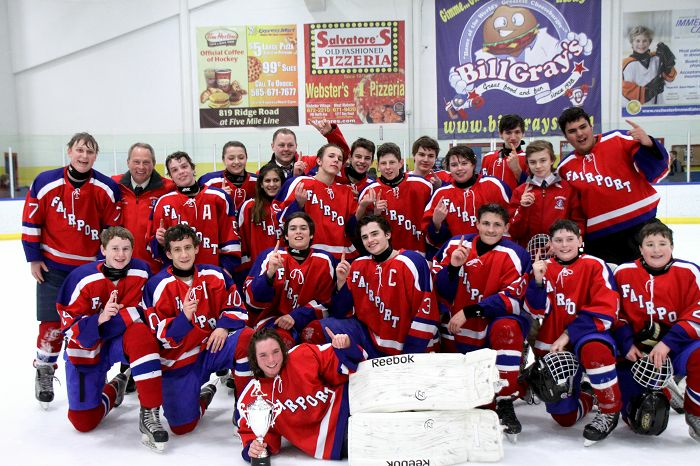 Congratulations to the Fairport JV Red Hockey Team for winning the Monroe County JV Red Division 2015 Championship on Sunday, February 8th, 2015. They defeated Webster Schroeder 3-2 in a shootout. The shootout was needed to determine the winner after scoreless 10 minute overtime. The JV Red Team won their semifinal game on Saturday against Victor 3-2 in overtime to advance to the final against Webster Schroeder. 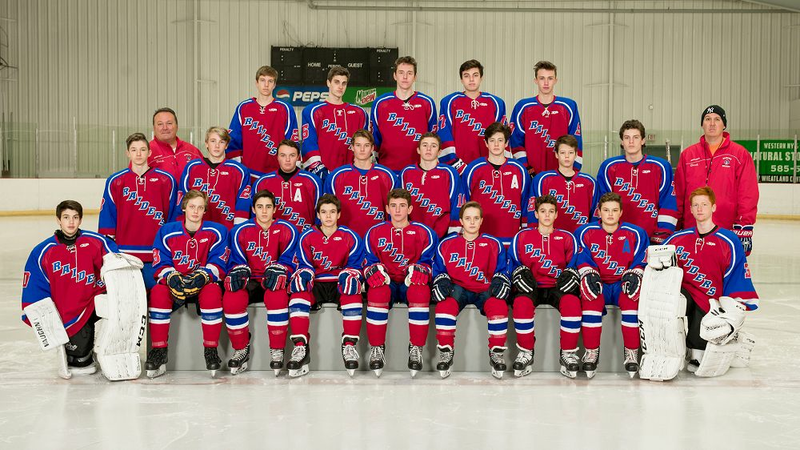 Congratulations to the Fairport JV Blue Hockey Team for advancing to the finals of the Monroe County JV Blue Division 2015 Championship on Sunday, February 8th, 2015. They were defeated by McQuaid Gold 5-1. The JV Blue Team won their semifinal game on Saturday against Pittsford 3-1 to advance to the final against McQuaid. Congratulations to both Fairport JV Teams on fantastic seasons! 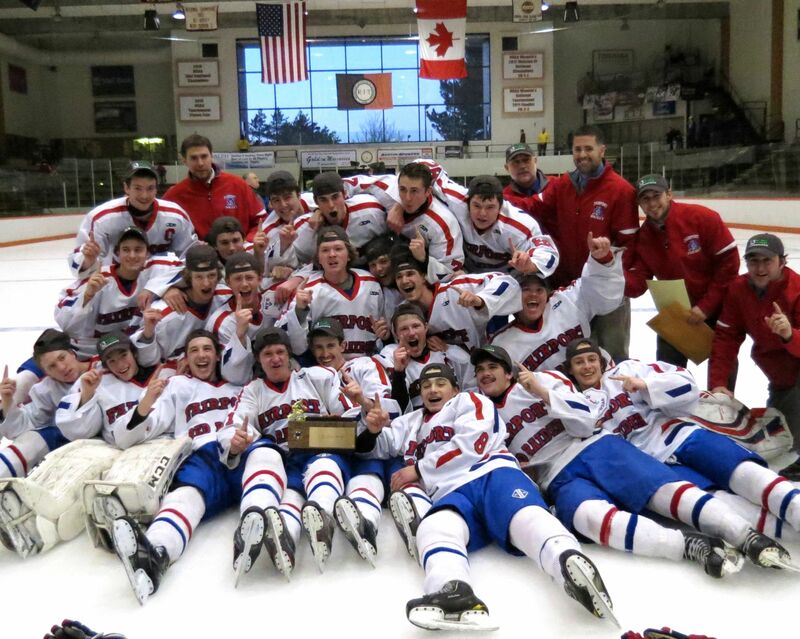 Attention Fairport Varsity Hockey Alumni - we are trying to build a database of alumni. Please let any teammates you are still in contact with know about this site. Click the blue Register Now button in the upper right to register. 2014 Section V Class A Champions! If you’re just getting back from Winter Break you missed an amazing week of hockey for the Red Raiders! They beat Brighton in their quarter final game 9 to 1 leading from wire-to-wire. Then they dug down deep and beat McQuaid on Thursday 2/20 3 to 2 in Triple OT to advance to the Class A Championship Game. On Sunday 2/23 the Red Raiders defeated Greece Thunder 3-0 to win the Section V Class A Championship. Fairport wins the NYS Division I Regionals against West Genesee 1-0 on Sat March 1st at Shove Park in Camillus. 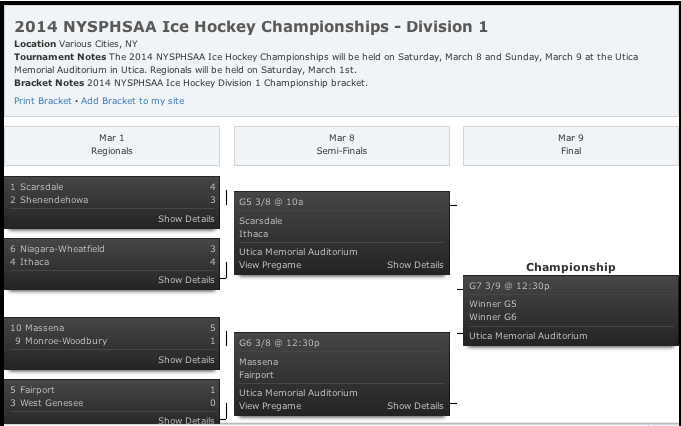 The Raiders move on to face Massena in the New York State High School Hockey Final Four at the Utica Memorial Auditorium on Saturday 3/8 at 12:30PM. Please come on out and support your Raiders in what figures to be another exciting game!